In order to facilitate users, Jazz has launched “Jazz World’s App“. Now Jazz users will be able to subscribe to their favourite package from the App rather than remembering or checking out codes for a specific package. One can easily manage their account in just a few taps. 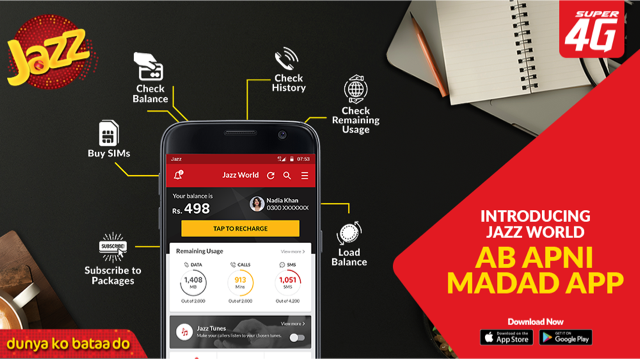 Jazz World’s App uses the latest technology with real-time integration to Jazz’s systems on billing information, recharge, and data consumption. To promote transparency, the usage history feature allows you to access Call, SMS and Data history with a single click. This app will save a lot of time as previously we had top call helpline for activation of any service. Forget about using different codes, download the Jazz World’s App now and activate your favourite packages with a single tap. Jazz World’s App is available for both Android and iOS. Download it on Android by clicking here.